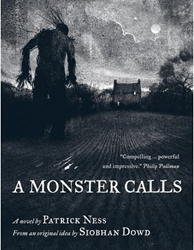 English title: A monster calls. Spanish title: Un monstruo viene a verme. Hard ground and sand to be felt. A monster to be terrified of. The same feeling, the same fear, the same nightmare he’s been having long before his mother even started her treatments. He wakes up in his bed -00.07 on the digital clock- heavy-breathing and covered in sweat just to find out something is outside the bedroom window: a monster. But it isn´t the monster he was expecting to find, it´s not the monster of his nightmare. 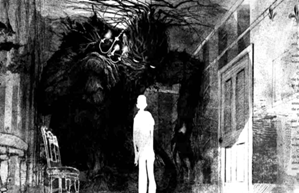 The monster standing in the backyard has branches gathered into a great and terrible face, shimmering into a mouth and nose and even eyes, watching him. The rest of the body is more and more branches twisted around others mixed with needle-like leaves and pointy ends. Connor isn´t afraid of this monster, but he would be as he wants the most dangerous thing from him. He wants the truth. I know this can´t be said to be a review as it doesn´t give you enough information to figure out what the plot of the book is but in my defense I have to say that´s better if you don´t know more than that information. 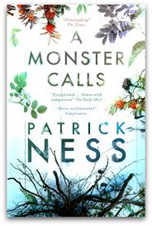 Personally, when I ordered my copy of “A monster calls” the only thing I knew about it was the information the back cover offered – which is way less than the one I offer you in this review- and that was enough to convince me to buy it. I strongly think the less you know about it, the more you’ll enjoy it and get surprised about this boy and all the things he has to deal with. In one single book, Patrick has created an unusual dramatic, fantasy story which involves loss, hope, a wise voice and monsters-the ones that live under our beds and the ones that live within us. 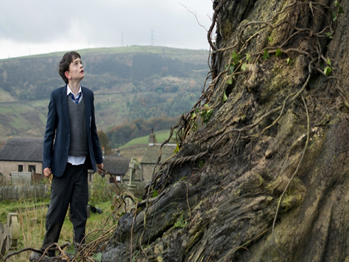 -“A monster calls” will be adapted to the big screen by Focus Features. 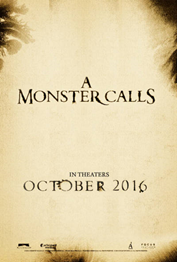 It´s a collaboration between Spain and USA as the director is J.A.Bayona and the screenplay is being written by Patrick Ness. The confirmed actor and actresses are Lewis MacDougall ,Liam Neeson, Sigourney Weaver and Felicity Jones. The release date is expected to be October 14th of 2016. 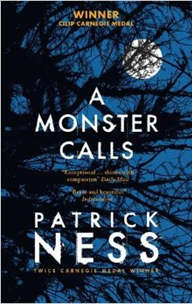 -The original idea of “A monster calls” by the writer Siobhan Dowd was turned into a novel by Patrick Ness – who dedicated her the novel- as she died from cancer at the age of 47. She wrote four books, two of them were published after her death. In 2009 she became the first author ever posthumously awarded the Carnegie Medal. 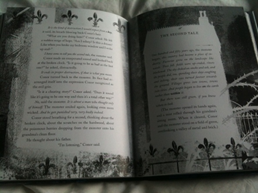 This edition of Walker Book (the info is above) (www.walker.co.uk) has drawings by Jim Kay-who won the Kate Greenaway Medal for them- that are just so well done and beautiful that I couldn´t resist to talk about them. (This and the Spanish copies are the ones I own).